If you've received your pre-ordered copy of The Old Republic, make sure the box contains your registration code. Several copies were shipped without it. 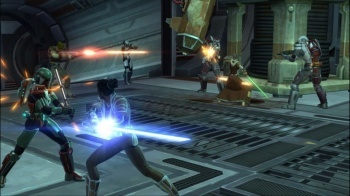 Star Wars: The Old Republic is set to launch tomorrow, after years of hype and anticipation. A lot of people pre-ordered the game from online retailers, many of whom shipped out the game early so folks would have the game available to play as soon as possible. Unfortunately, it turns out that a lot of the games were apparently shipped out without the registration code in the box, which means that they're unplayable until the situation is rectified. The Star Wars: The Old Republic forums are jammed with users complaining that they bought the collector's edition of the MMO, only to find the registration cards inside the DVD case have no visible numbers. Also, it's being reported that some copies of the title don't even have game discs. If you don't have a registration number, you only have a two-day grace period before you'll be unable to play the game. In order to best assist you, we ask that you please send a request in game ticket or an e-mail to [email protected] with the subject missing product key. Please make sure you include as many details as possible and a list of the item missing, product code or anything else. Make sure, you include missing product key in the subject please and in the message itself. Please use the exact same subject as displayed; this is a very important point. If you have already sent an in game ticket, please try to update the subject and the message, or if you cannot, please create another one. This is not a promising start for The Old republic. People with early access have been reporting that the game still suffering from a number of bugs, and others are reporting that there are some insanely long load server queues to suffer through. Hopefully BioWare is able to resolve this latest issue soon.